The Gospel is the Greatest News & Most Important Message you will ever hear. 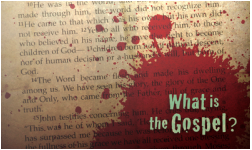 But as important as the Gospel is, it is often misunderstood, distorted & over simplified. Many People think that the Gospel is merely 'going to church and having a purpose or meaning to your life’, or some reduce it to 'inviting Jesus into your heart and having a personal relationship with Him.’ All of which are true, and good, and important, but they really don’t get to the heart of the Gospel. The heart of the gospel is redemption, and the essence of redemption is the sacrificial death of Jesus Christ in our place for our sins. The Gospel is called the ‘Good News’ because it addresses the most serious problem that you and I have as human beings, and that problem is simply this: God is holy and we are not. And at the end of our life, we are going to stand before a just and holy God, and be judged. And we will be judged either on the basis of our own righteousness (or lack of it) – or the righteousness of another. The good news of the Gospel is that Jesus lived a perfect life of righteousness & obedience to God, not for himself but for His people. He did for us what we could never do for ourselves. But the amazing thing is that He not only lived perfect life of obedience, He also offered Himself as a perfect sacrifice to rescue & redeem us! Jesus died so that we could live - that's the gospel. The good news is the proclamation that in Jesus - all our greatest enemies of Satan, Sin, Death, Hell & the Wrath of God have been defeated. Christ has won the victory! So the question is - How are we Saved? The Bible makes it clear that we are justified not by our works, not by our efforts, not by our deeds, but by faith – and by faith alone. The only way you can receive the benefit of Christ’s life and death is by putting your trust in Him – and in Him alone. When you do that, you’re declared just by God, you’re adopted into His family, you’re forgiven of all of your sins, and you begin your new life. If you have any questions about the Gospel or if you're not sure that you are a Christian let us know. Pastor Mike would love to share with you from the Bible the truth of the Gospel & how you can be forgiven & have eternal life.